dr. brandt® skincare is the natural evolution of Dr. Brandt's professional dermatology practice and clinical research. I have used some of Dr. Brandt's products before, such as his Laser FX Bright Serum (read my post HERE!) which was a great skin savior to my combination skin! His Pores No More pore refiner is great to use under the makeup since it minimizes the look of pores and makeup application is smoother. Xtend Your Youth (XYY) Dual Fusion Water have removed my toughest eye makeup, mascara and liquid liner without irritating my skin. In short, dr. brandt® skincare is one of the greatest skincare brands out there, I really highly recommend! "We will become first in the minds of women who desire the most beautiful, youthful skin possible -- not because we market better, but because we develop better." 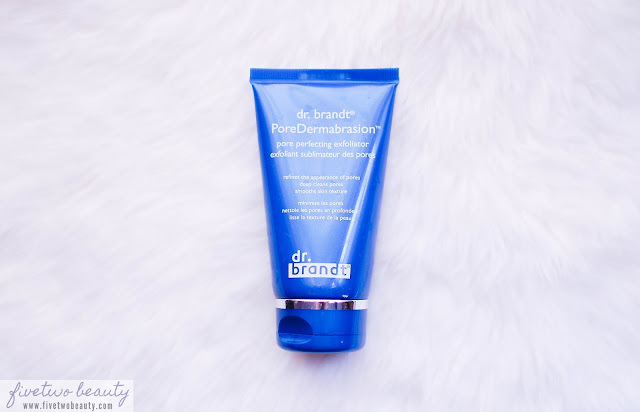 dr. brandt® PoreDermabrasion is a unique professional grade physical and chemical exfoliator and pore perfector in one. No matter how old you are or what type of skin you have, enlarged pored are a huge concern. Shrink them down to the vanishing point while smoothing and evening skin's texture. I use this once a week since this had dried out my face when I used it twice in one week. The very fine grain in this product is pretty heavy duty on the skin compared to other exfoliators out there, but then that is because this is the heavier duty product that will do a deep cleaning of your pores. My most pore-concern area are around my nose and the tip of it. I have noticed that it does great deep cleaning of my face and of my pores as I have not have any problems of any blackheads or whiteheads since using this. A weekly exfoliation of the skin really helps to not get the blackheads and whiteheads from coming back. I haven't really noticed any of my pores being more refined (or minimized) since I have used it for the past 3 weeks, which is just 3 times of using it. I do think it will take time before I do see any minimized pores as I only use this once a week. I do like that there is a heavy duty exfoliant product out there to get my face a nice deep cleaning once a week at home. My skin feels really smooth the next few days which makes the foundation application looking super smooth! I can't say it enough but investing on great skincare products will give you a better makeup application and great skin in our later years.